Thomaston is a lovely town just an hour southwest of Atlanta. It’s known as one of the best 100 small towns. The art scene is growing thanks to our member Fawne DeRosia. She runs the Flint Rose Studio. 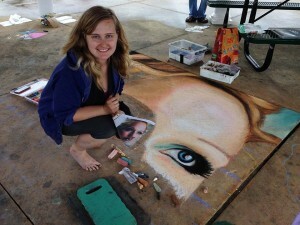 I met her a few years back at the one-shot Macon Chalk Festival. 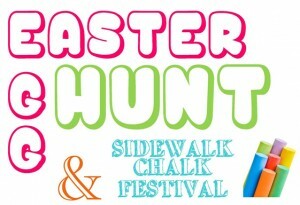 She extended an invitation to our members for a Chalk Festival and Easter Egg Hunt in Greatest Generation Memorial Park. 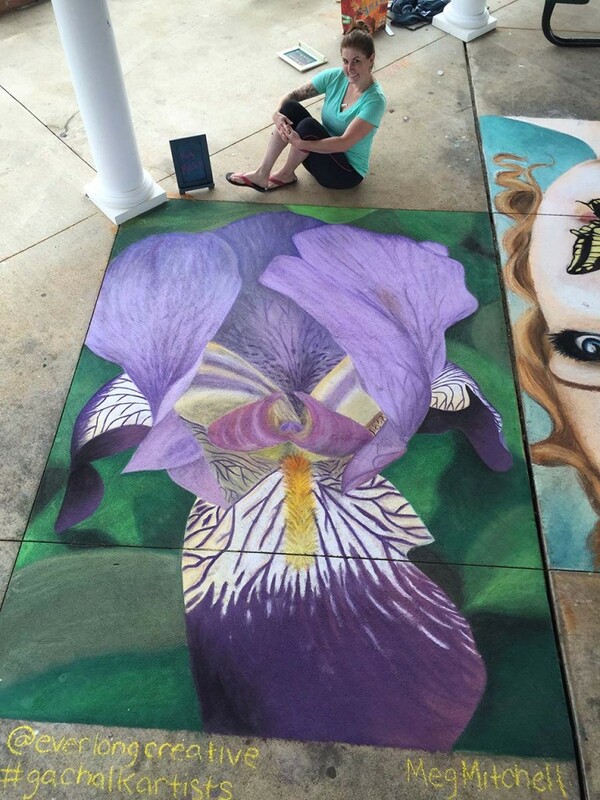 This was a great opportunity for us to chalk locally, meet other chalk artists, and share the art with others in Georgia. 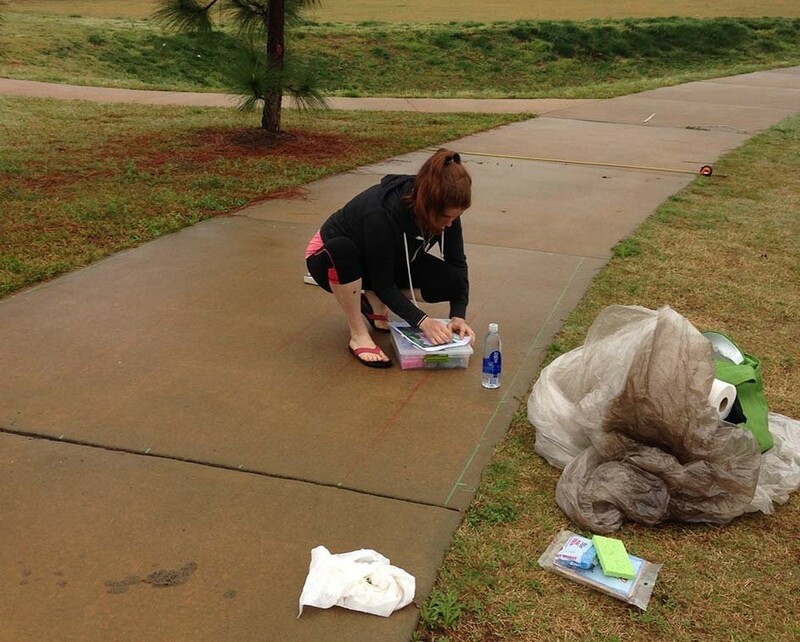 Meg tried to draw on the wet sidewalk but her chalk was smearing and washing away. Our arrival in Thomaston came with sprinkles. No, not the cupcake kind, but the wipe off your glasses and cover up your chalk kind. It seemed like the sprinkles may pass on and we tried to grid out squares to chalk, but the sprinkles eventually became rain. We all sat under the pavilion waiting for it to pass. We were all a little down that we wouldn’t get to chalk and hunt Easter eggs. That’s when Zach had a grand idea! Instead of sitting around under the pavilion, we could just start chalking in there! So Ed, Meg, Zach, and I put our heads together with Fawne and had all the tables moved out so we could get started. 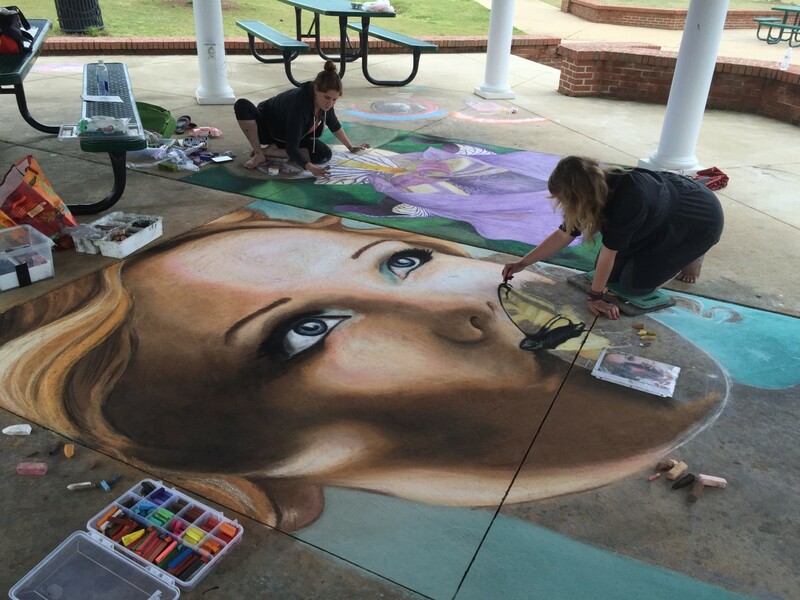 A few other artists also stuck around and chalked as well. 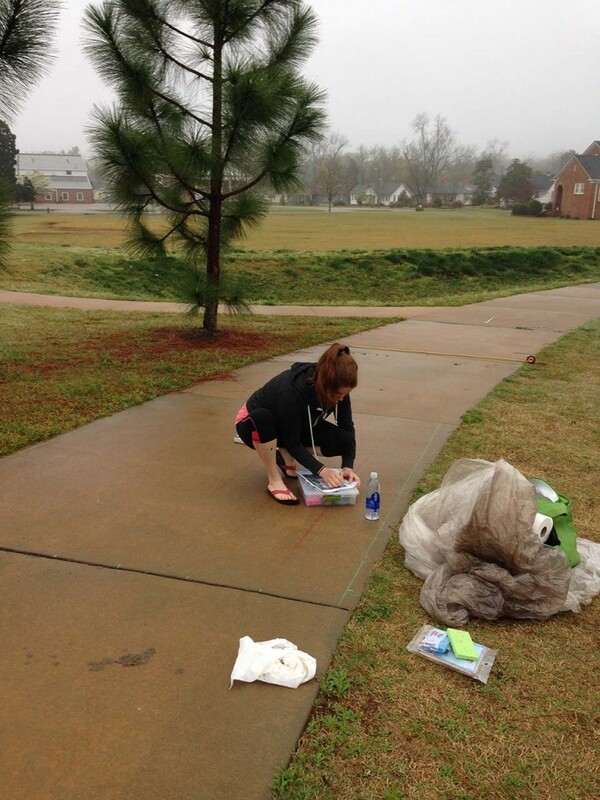 Jessi was glad to be able to chalk despite the rain! The art was a success. 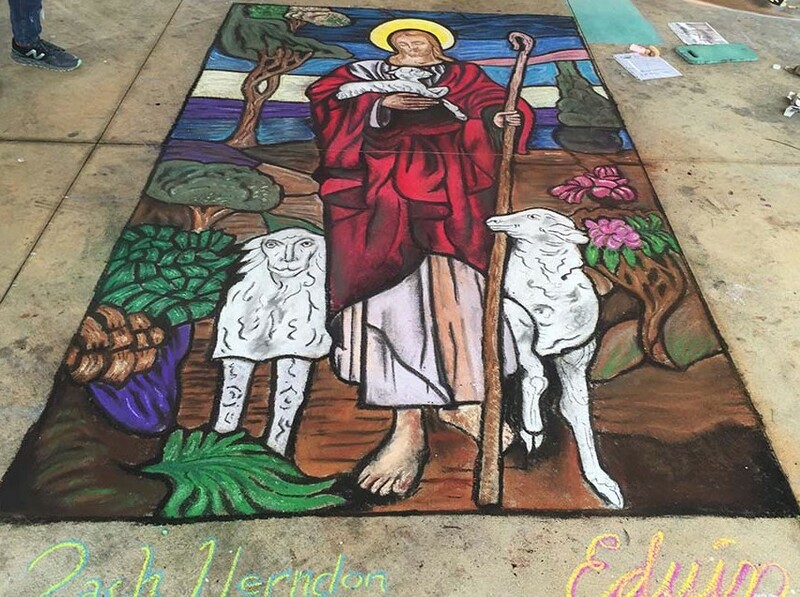 Zach and Ed teamed up to create a Stained Glass of Jesus as a Shepard. They made it big at 12ft tall. It quickly evolved in a nice blend of Ed’s energetic drawing style with Zach’s sharp lines. On one side of the pavilion, Meg chased after her flower and did an amazing job. The flower she drew came out of her own garden, which is awesome since not only did she draw the flower but she also grew it. The detail of the petals looked so good. 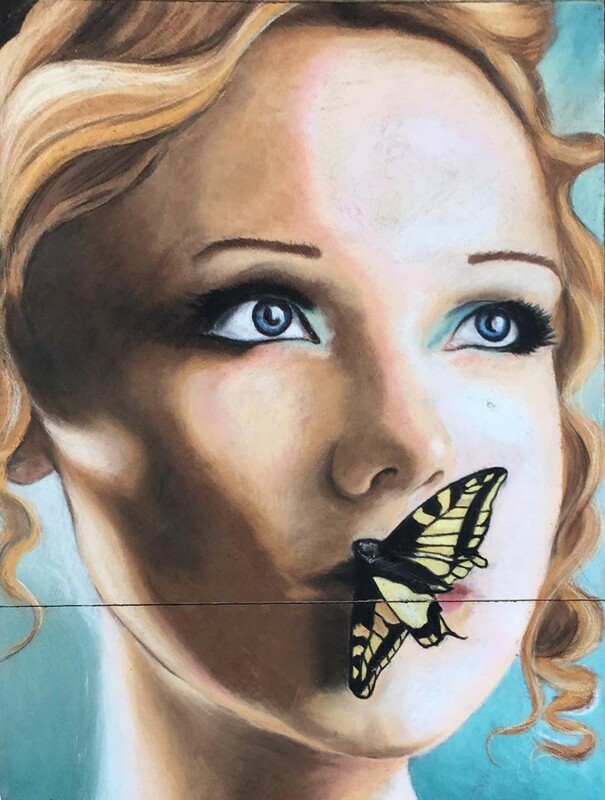 On the flip side of the pavilion Jessi drew a young woman with a butterfly on her nose. The atmosphere was very chill. While everyone chalked the event organizers and other locals watched quietly and made conversation. Since the event itself was postponed until next year, the only folks present for most of the day were organizers and chalkers. We had some awesome sponsors including the Mayor of Thomaston! Our friend Kevin came to watch and ended up chalking some too. 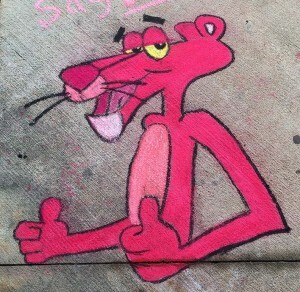 He chalked a pink panther. A group shot minus Ed!